The desire to use green products seems to be gaining more momentum in hair care trends these days. With both salon and drugstore brands launching new lines that promise all the goodness of botanical ingredients, it's hard not to be enticed. While there have been specialty brands popping up in drugstores that offer great alternatives with a green twist, I haven't really noticed many big efforts by the big drugstore brands. 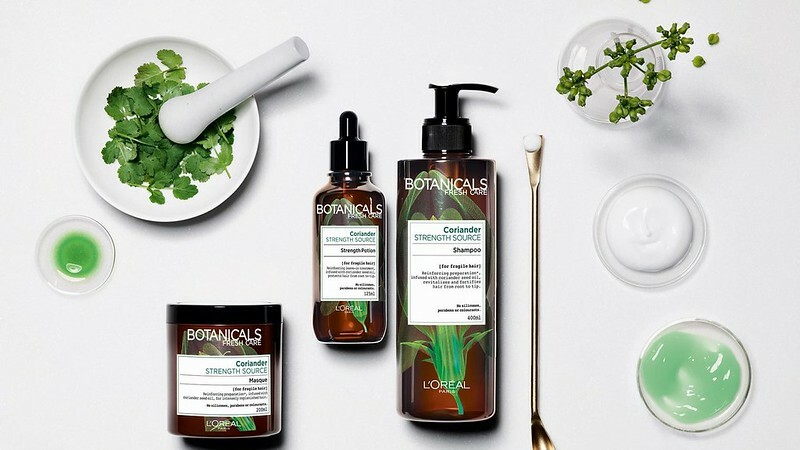 But not anymore though: L'Oréal Paris has now launched a completely new line of products under the name "Botanicals Fresh Care", featuring four different types of products based on four key ingredients and hair care desires. 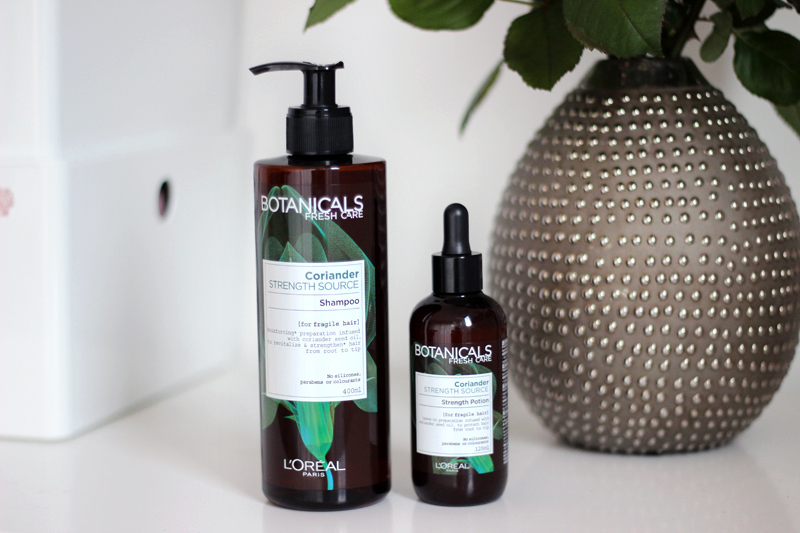 The Botanicals Fresh Care range launched exclusively with Di in Belgium, and to celebrate they included two products from the Coriander Strength Source line-up in their DiScovery Box. This would be the range I'd choose personally as well as my hair is quite thin & brittle with some hair-loss when I'm stressed out, so I was pretty stoked to try these out! I had already seen pictures of the launch pop up on Instagram, and because of the great packaging and look & feel I even mistakenly thought this was a new salon brand being introduced. 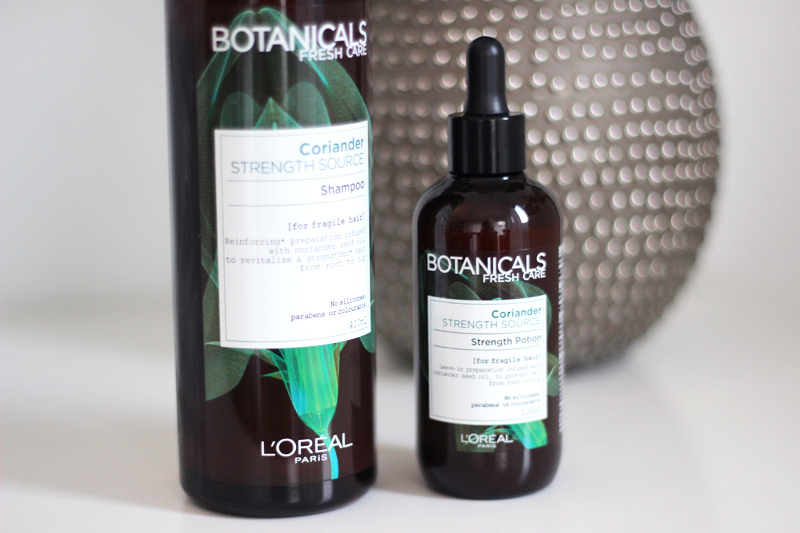 The Strength Source products all contain coriander extract, which promises to reinforce brittle hair and reduce hair fall-out. In the formulas you also won't find any silicones (read more about silicones in hair care here), parabens or colourants. This is definitely more of a luxury range within the drugstore hair care offerings, which is great as not everyone has the funds to splurge on salon brands and this is a good alternative. The Coriander Shampoo has a gel-like texture and although it does contain SLES as a foaming agent, it only foams very lightly which does take some getting used to. I use about three pumps for my mid-length fine hair. 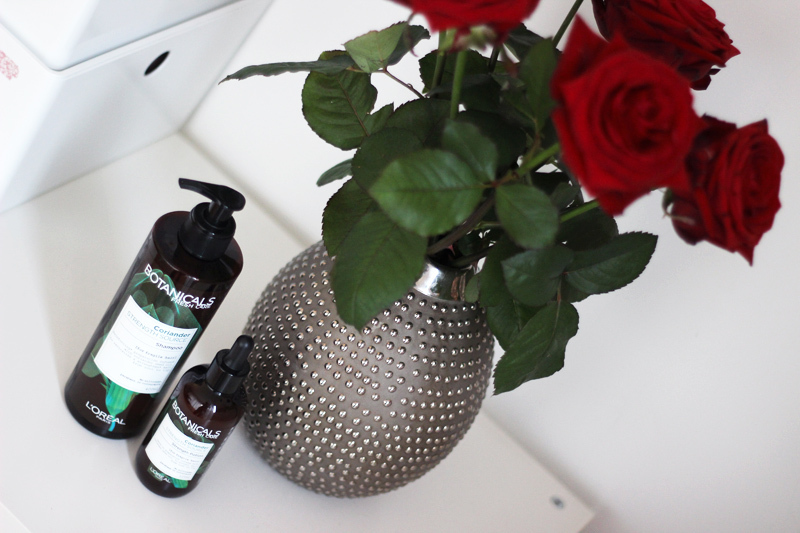 The scent is heavenly: it's very herbal and refreshing, the perfect pick-me up when washing your hair in the morning. In the formula you'll also find coconut oil pretty high up in the ingredients, but this doesn't weigh down my hair. 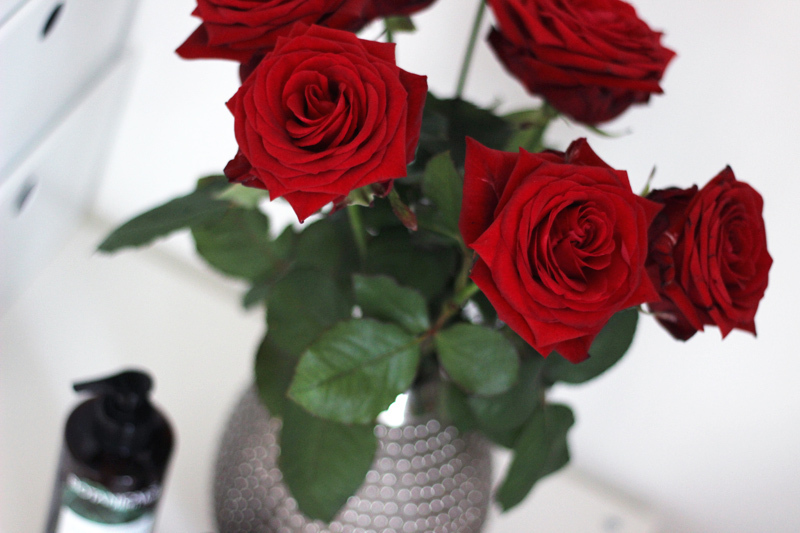 After shampooing my hair feels clean and soft, and very importantly as well it does not irritate my very sensitive scalp which definitely helps prevent hair loss, as I find that I tend to shed more hair when my scalp is irritated. The Coriander Strength Potion comes with a dropper instead of a spray, which does give more of an apothecary preparation vibe to the product. I apply one full dropper of product to the lengths and tips of my hair, which doesn't seem like much as the product is so watery, but as the label advises to use just a few drops I didn't want to overdo it either. While I do find coconut oil very high up in the ingredients, there is also some mineral oil to be found on the bottom of the list. The treatment still feels very light-weight though, does not weigh down my hair and does not have that slippery silicone-y feel to it afterwards. And again: the scent is amazing! In short: if you're completely smitten with the green hair care trend, but don't care for the ultra green shampoo bars but want to try a more accessible drugstore alternative.. This is a great range to try out that won't break the bank. 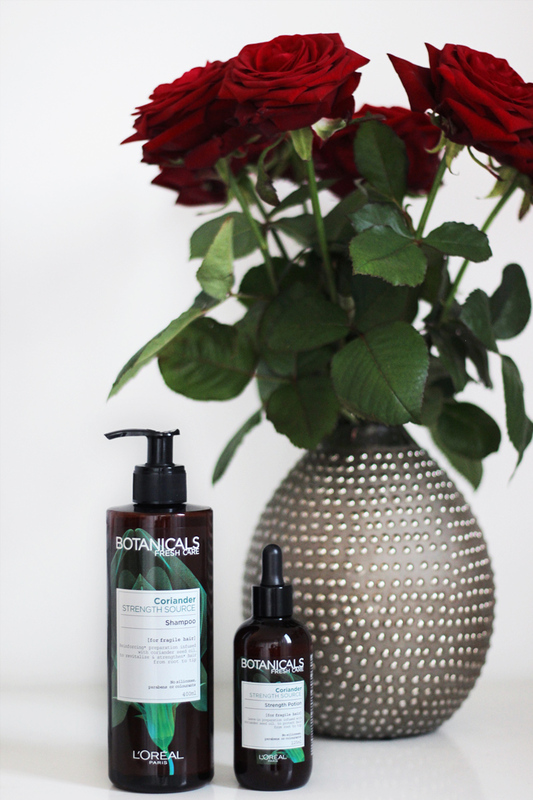 Apart from this Strength Source range, there are three other categories within the Botanicals brand - Smooth Ritual, Rich Infusion & Radiance Remedy - that suit other hair care needs. More info can be found on the Botanicals website.